Picture the scene, it's October 1974, you've just got the latest edition of Look-in magazine, Slade are at number one with 'My Friend Stan' and you've got 50 pence burning a hole in your shorts' pocket. You've been in school all day, the school overlooks a field where twice a year Silcock's Travelling Fair park all their trucks and caravans before taking the trucks over to the local marketplace to build up the fair after the market traders have gone home. At 3.30pm the school bell goes, you and your mates walk down to the marketplace on the way home and watch the fair being built up, later after bolting your tea down in front of Marine Boy and Hector's House on telly, you get your racer (or Chopper) out of the shed and ride back down to the marketplace to watch the rest of the rides go up. Rumours are around that if you wait until the rides are built up they give free rides while testing. Once the rides are up, the activity dies down and the rides are sheeted up with tarpaulins and the 'closed' signs go up. The free rides never did materialise, but you had to wait, just in case. The next day once again you spend an eternity at school waiting for the bell to go. When it does, you race home for tea with another helping of children's TV before making your way down with what seems like the rest of the town to the market place. Dusk is already beginning to fall and before you get there you can hear the bass of the music blasting out and the steady hum of the generators. The market place, which is by day either a car park or rows of market stalls, is transformed into a magical place of mixed-up noises, smells and lights. The first bars of The Rubettes 'Sugar Baby Love' are blasting out from the huge bass bin speakers attached to the framework surrounding the Cyclone Twist, while Sparks are telling us that 'This Town Ain't Big Enough For Both Of Us' on the Waltzer. 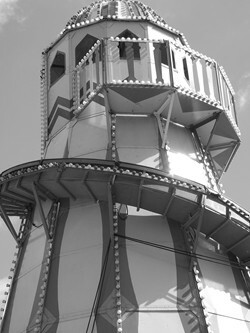 You make your way through the side stalls and other rides and climb the steps of your favourite ride, the Speedway. As the ride goes round at a crawl The Three Degrees are singing 'Year Of Decision', the ride operator is enticing the punters to jump on. You fumble in your jeans' pocket for your 10 pence fare and find an outside bike to sit on. The platforms twist as the ride gains more speed and you catch your breath trying to look cool while hanging on to the bike handlebars. A voice shouts out over the speakers, 'do you wanna go faster?!!' and the ride gains even more speed. The music swirls round as you go past the speakers and you have to lean right over to keep yourself from being thrown off. Again the shout of 'do you wanna go faster?!!' goes out. Surely it can't go any faster but it does! Eventually you feel the speed ease off and you can relax a bit, try to look cool, do a bit of posing and hope you see some of your mates watching or even that girl you fancy from school. The last night of the fair always found you scratching round for money, down the back of the sofa, in your bedroom skipping lunch at school trying to get at least 10 pence together for a last ride on the Speedway and may be a go on the side stalls to win that bow and arrow. Rumours at school were again rife saying that all the rides went faster on the last night of the fair as the showmen had to use up the remainder of the diesel in the generators. Did we believe it? 'course we did. Well I was only 12 years old. In the morning on the way to school the market had returned to its old self, the magic had gone until next April and all that was left were the pellets from the air rifles, most of which had been squashed under the wheels of the lorries. I'm sure everyone has their own memories of the fair in the 1970's and indeed all the other decades before and after. The thing that 'made it' all come together for me was the music. Without the music, the fair would have been a very different place. I think riding Silcock's Speedway with Showaddywaddy's 'Hey Rock And Roll' playing at a 100 times the volume I'd heard it before is my all time favourite memory of the fair.